Several analysts lowered their outlook on Fortune Brands on Friday after the consumer goods company and owner of Jim Beam and Maker’s Mark bourbons reported second-quarter results. 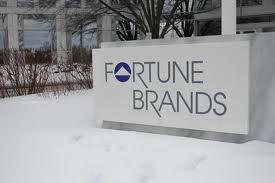 Fortune, which is in the process of splitting up its businesses, reported Thursday that its liquor business grew during the period but its operating income fell because of weak demand in its home and security business. Baird analyst Peter Lisnic maintained a “neutral” rating on the company but lowered his 2011 earnings outlook from $3.25 to $2.60 per share to reflect the sale of Fortune’s golf business and weak home and security results. D.A. Davidson & Co. analyst Tim Ramey said the weakness in home and security and weak profit margins in liquor were the main issues for the period. His concern is that the weak economy will delay a recovery in home and security and hurt the valuation of the business.